This swift is my husband's custom design, and I've been the picky tester! It's the best thing I've ever used! Very stable and runs very smoothly. There's no need to clamp it to a table. I usually put mine on top of a stool that I can move anywhere I wish. Easily adjusts to handle hanks of up to approximately 72" circumference. Uprights slide along the slots and screw to tighten. 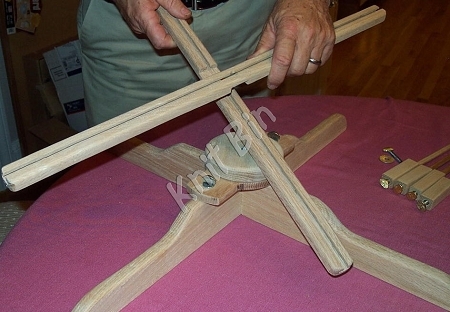 This swift is made of red oak, and comes smoothly sanded, but unfinished so no oils will be absorbed into your yarn. It will be shipped disassembled to reduce shipping size. 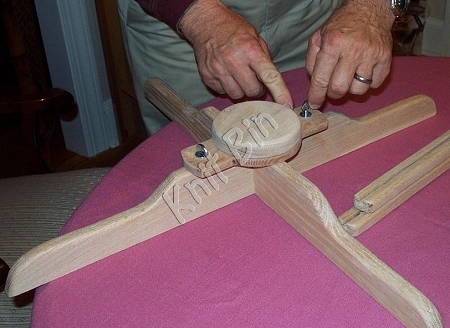 Assembles easily with three thumb screws...no tools needed. This design works SO much better than an umbrella swift. I'll never go back! 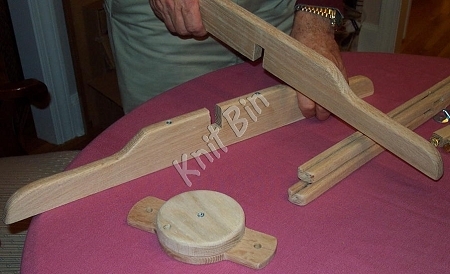 For yarn dyers and other heavy users, we recommend that you get the heavy-duty model that has thicker uprights. Since these are specially prepared, there may be a shipping delay of 1-2 days. A heavy cotton drawstring storage bag is an additional $12.00. 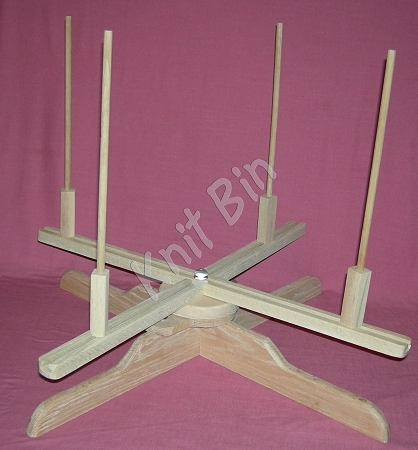 We also offer a model with a smaller base that is also very stable and has the same circumference. We'll take special orders if other types of wood might be desired. Price will depend on wood and labor cost. Note: We have begun to make the four uprights a little shorter than those shown in the picture since we found the length to not be necessary. If you have a preference, please let us know. I am so glad I found this excellent swift. It is both functional and beautiful. I love how easy it is to set up and use-- and how easy it is to tidy away. My husband and daughter love it too: no more standing about holding skeins of yarn on their arms, and a whole lot less detangling!